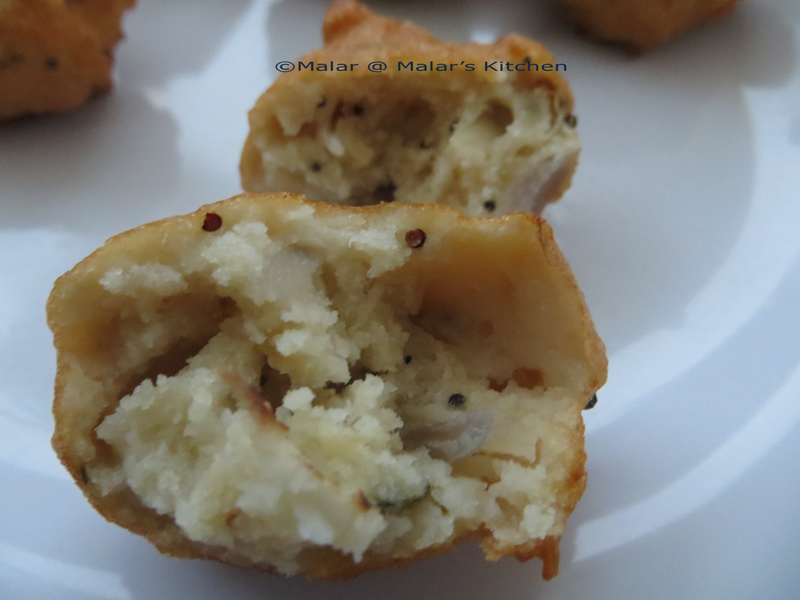 This is a very famous Chettinad delicacy which you can find in any marriages or small functions held for evening snack. The great advantage of this item is that, it need not be perfect in shape. It would never go wrong in taste and ingredients are quite simple. It has a crispy outer layer and soft inner layer. Recipe is from my grandma. Soak Raw Rice, Urad dal separately in water for at least 3 to 4 hours. Drain water and grind both together to a smooth batter (preferably in wet grinder) using very little water. 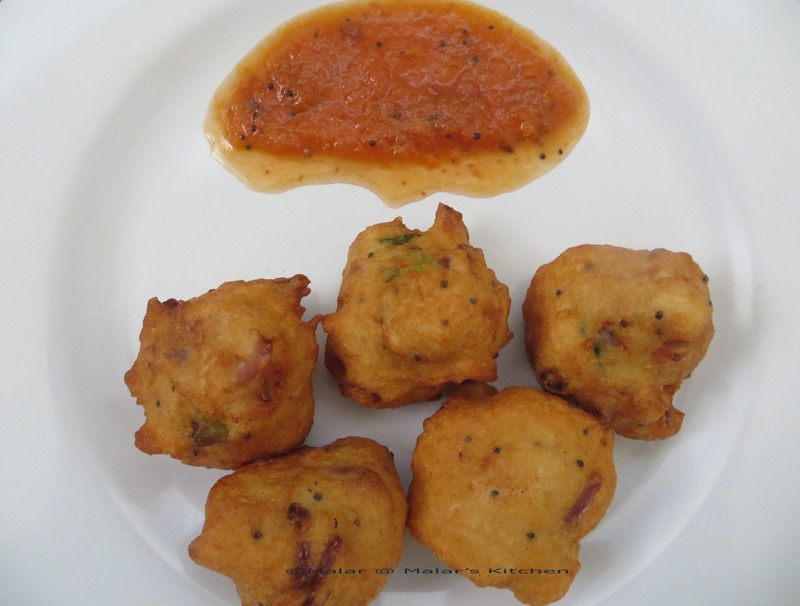 It need not be too thick as vada consistency, it can be little watery than vada batter. In a pan heat 1 teaspoon of oil, add mustard seeds. When it splutters add curry leaves and then add onion, green chili saute for 2 to 3 mins. Remove from heat. Add this to the batter and mix with salt. Now make small balls with the batter in hands and slowly drop then in oil one by one. Fry till golden brown (when the sound of oil reduces) and put them in plate with tissue paper to absorb extra oil. 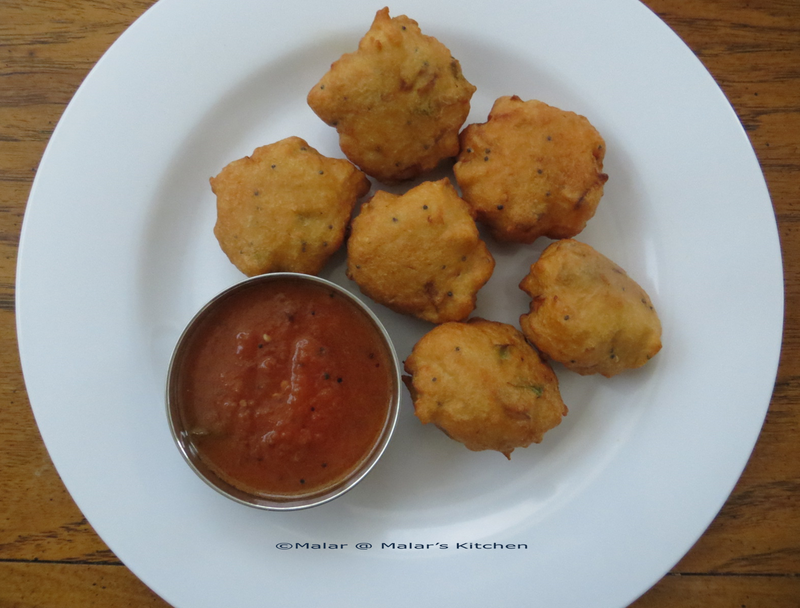 Serve with tomato chutney or coconut chutney. Lovely recipe…. We make something similar called punugulu in Andhra Pradesh. Thanks, Malar and Shruti for this crunchy-munchy. There is something satisfying about deep-fried snacks, isn’t there?